When it's time to whip up a batch of biscuits or scones, don't worry if you are out of Bisquick. Most pancake mixes are very similar to Bisquick and contain flour, leavening, salt and hydrogenated oil. 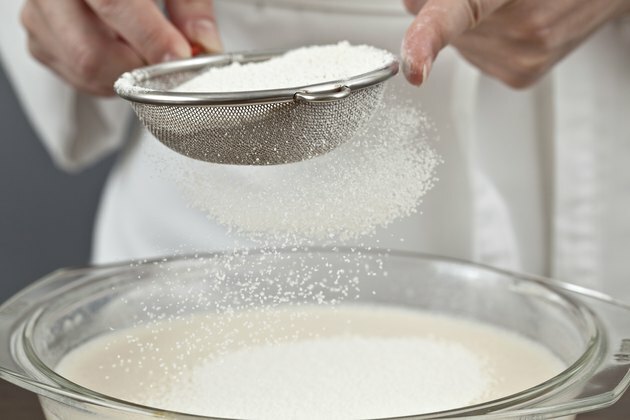 Pancake mixes may contain slightly more sugar, though, resulting in a sweeter final product. They work best for sweet breads, muffins and scones rather than savory dishes when substituting for Bisquick. Measure 2 cups pancake mix into a mixing bowl to make biscuits. Add 1/2 cup milk and any seasonings, such as garlic or cinnamon. Slowly stir the mixture together until it is completely blended. Don't over-mix, though, or the biscuits will turn out tough. Omit sugar if the recipe calls for it. Cover the dough with a towel and wait five minutes. This waiting time tenderizes the dough, making it easier to roll out. Flour the work surface and roll the dough out until it is 1-inch thick. Cut the dough into squares or wedges, or cut with a cookie cutter or glass to make round biscuits. Place the biscuits on a cookie sheet, spaced at least 1 inch apart. Bake for 10 to 12 minutes at 350 degrees Fahrenheit, until golden brown. Allow the biscuits to cool slightly before serving. Serve biscuits with honey or jam to complement their sweet taste. Substitute pancake mix to make waffles and sweet breads, as well. Bisquick and most commercial pancake mixes have high amounts of sodium, as well as hydrogenated oils. Look for natural, whole-grain pancake mixes or make your own mixes for a healthier alternative. Homemade biscuits are simple to make and have a fresh taste and fluffy texture. Try your hand at homemade biscuits and forgo the mixes altogether.